The biggest democracy in the world is preparing for general elections. And the two main political parties both have problems: mass murder in the past. The most popular candidate for prime minister (from polls in March) is Narendra Modi, of the Bharatiya Janata Party (BJP). He was Chief Minister of Gujarat in 2002 when more than 1,000 Muslims were killed in a massacre. The people who survived and journalists say the state helped in the massacre. But Modi is still popular. His Hindu nationalist party is rightwing (and against free speech). It is popular with many people who do not agree with accepting other religions. But secularism (when the government is separate from religions) is part of India’s constitution. At the same time, the Indian National Congress, that supports secularism, has the problem of an older massacre. In 1984, more than 8,000 Sikhs were killed in a massacre after the assassination of Indira Gandhi (by her Sikh bodyguards). The famous son of the Nehru-Gandhi family, Rahul Gandhi, was a child at the time. He is now head of the Congress election campaign, and he cannot explain why none of the Congress politicians involved in the massacre have been brought to justice. In both cases, political figures have gone free. It is well known that Modi was freed from all responsibility by a Special Investigation Team from the Supreme Court. A recent book has shown that this ‘investigation’ was when one person asked questions to Modi, and believed everything he said. The British and US political establishments were not friendly with Modi. But now they have quietly built up a relationship. 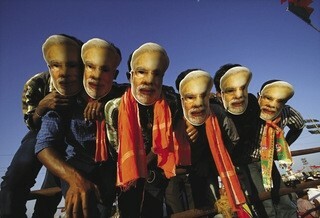 The voters in India think the economy and corruption are more important. Both the Congress (not so socialist now as they were before) and the BJP want to win middle-class voters by talking about getting more investment. This investment will not help the 400 million citizens who live in total poverty. But there is another new party. This is the Aam Aadmi Party (Common Man Party). Its leader, Arvind Kejriwal, used to be a tax inspector. The candidates are activists who have entered politics, and they are getting popular. They will probably not win much now, but it will be good if they become more important so that they have some influence over the next ruling coalition.